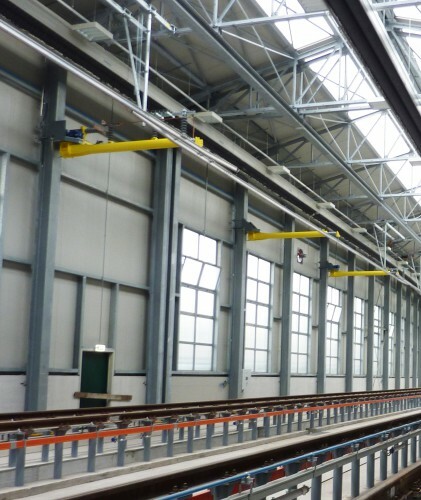 The retractable rigid catenaries permit to freely let in and get out trains and locomotives in railway maintenance depots and workshops, without interruption and without additional hauling systems. When the foldable rigid catenaries are retracted, they release needed space above the train to make all the necessary maintenance operations and make possible the use of gantry crane. An interlocking management permits to work in secure conditions around the track, safety insured thanks to a perfect electric isolation, automation of all equipment, and declutching motor. In folded position, the system facilitates the roof access to operators. Thanks to a perfect synchronization with motorized jib arms, without shaking effects, the system is unfolded and supplies all voltages to rolling stock for moving or electrical tests. The system allows to mix diesel and power supply rolling stocks on the same tracks, and guarantee a compatibility with exhaust fumes extraction hoods and gantry cranes.